While overall card rates showed a slight decline, a spike in business reward credit card rates means that small-business owners looking for good deals on reward credit cards will have to shop smarter to find cheap rates. The average business reward credit card rate offered on new accounts jumped to 16.21 percent from 16.03 percent in the last two weeks, the second time rates for those cards have risen significantly this fall, according to the latest survey by IndexCreditCards.com. In the latter half of September, business reward credit card rates broke the 16-percent barrier for the first time since IndexCreditCards.com began tracking the market in late 2005, rising to 16.03 percent from 15.74 percent in two weeks. Today's average rate for business reward cards is almost two percentage points higher than the average 14.36-percent rate just one year ago. Average rates for non-reward business credit cards remained at 14.72 percent in the last two weeks, substantially lower than the rate for rewards cards, but still up from the year-ago average of 13.3 percent. 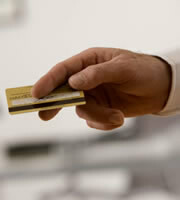 Reward credit cards are typically higher than for non-reward cards for both consumers and businesses. Despite the rise in business credit card rates, the latest IndexCreditCards.com survey results contained some good news. The average consumer credit card rate fell by a tenth of a percentage point to 16.67 percent from 16.77 percent. Non-reward consumer credit card rates remained the same at 15.15 percent, while average reward credit card rates for the consumer market fell to 17.32 percent from 17.46 percent. That's still well above the average rates of one year ago when the average non-reward credit card rate for consumers seeking new accounts was 14.58 percent, and the average reward consumer credit card rate was 16.53 percent. At this time last year, issuers were furiously jacking up rates on new credit card offers, as well as existing credit cards, to prepare of the onslaught of new federal credit card regulations. President Obama signed the Credit CARD Act in May 2009, but the most stringent restrictions on interest rate hikes didn't go into effect until February of this year. Although the law prohibits interest rate hikes on existing balances -- unless cardholders are more than 60 days late on payments -- and requires issuers to give 45 days notice of proposed increases on new purchases, it does not cap interest rates for new accounts. The law also does not apply to business credit cards, although some issuers have extended some of the protections to business card holders. Average credit card rates for college students remained unchanged at 16.23 percent in the last two weeks, and have fallen in the last six months. The average student rate in mid-May was 16.27 percent. Under the Credit CARD Act, young people under 21 must get adult co-signers for new credit card accounts unless they can show they have stable income to pay their bills. Whether this is impacting rates is unclear. IndexCreditCards.com accounts for all the rate tiers offered for each credit card in its survey. Issuers often charge two to four different rates for a single card, depending on the creditworthiness of the applicants. Rates are lowest for consumers with the best credit. The average credit card rate overall for consumers with excellent credit is 12.95 percent, well under the average rate of 16.67 percent for all credit levels. The highest credit card rates included in the survey top 22 percent.